For this dish use a heavy pan that will easily go from the stove top to the oven. A small dutch oven or deep sauté pan works well. Heat the pan to medium high heat with the olive oil. Coat the shanks lightly with flour and brown well on all sides. Remove the shanks from the pan and sauté the onion, carrot, celery and garlic cloves until they begin to brown. Add the parsley, oregano, salt and pepper. Sauté briefly to release the flavors of the herbs. Stir in the tomato paste and then the red wine. Return the shanks to the pan and add enough water or stock to bring the liquid level half way up the side of the shanks. Place the pan in a 325° oven. Braise the shanks until they are almost falling off the bone, about 2 hours. 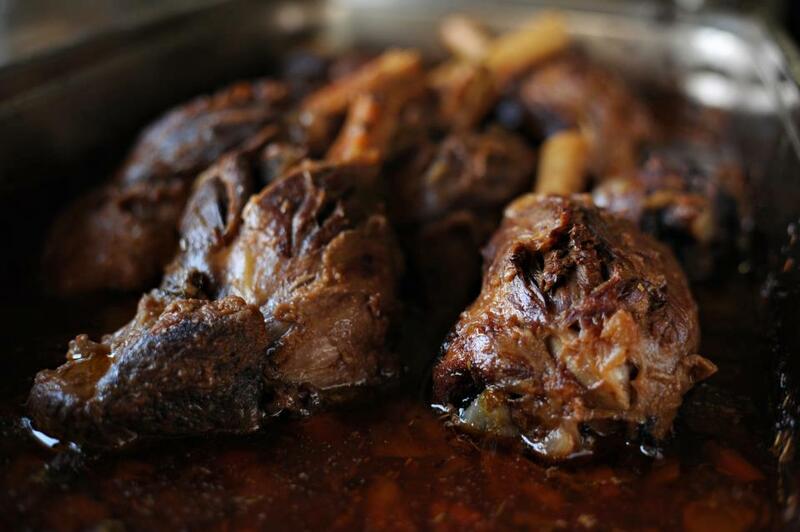 During the braising process turn the shanks over every 15 minutes to ensure even cooking. Serve with a little of the braising juice and vegetables over soft polenta or mashed potatoes. Paella ~ The possibilities are endless! 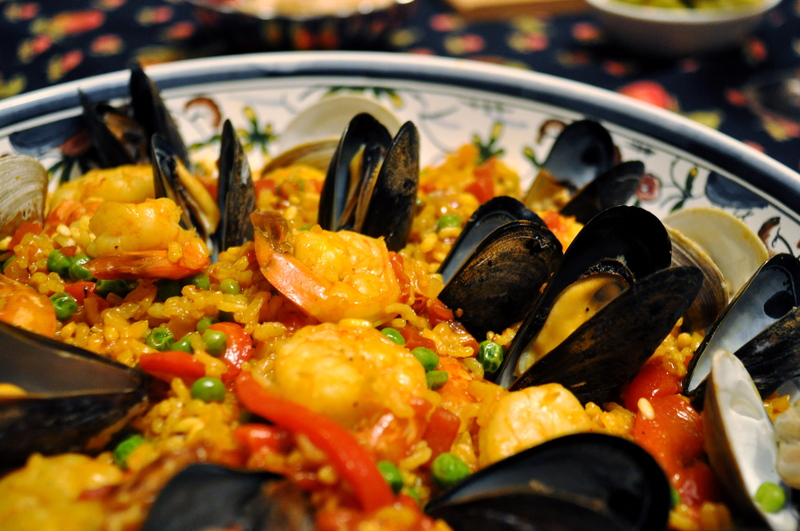 Paella originates from the province of Valencia Spain. 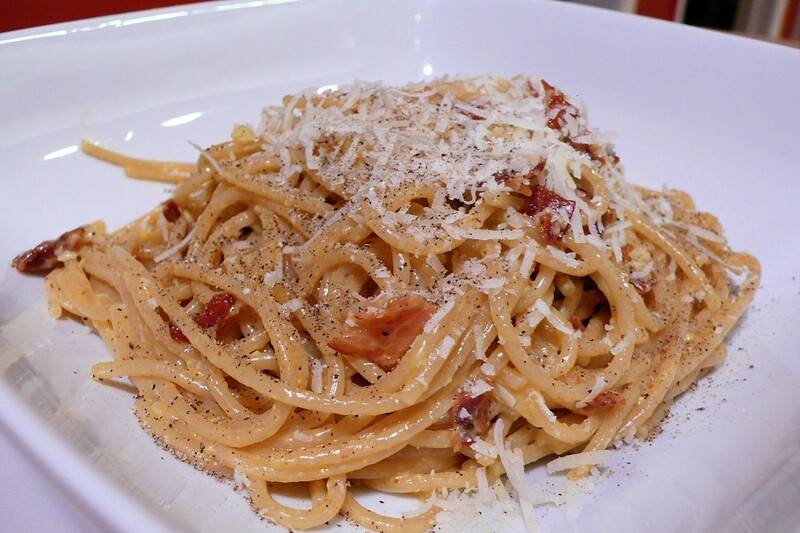 Originally a dish made by shepherds over an open fire, it is now popular all over the world. You can find Paella being made in restaurants, homes and still among the fields as a simple and humble picnic food. The only really necessary ingredients are olive oil, rice, saffron and peas. Beyond that is the dish of your own imagination. Early shepherds most often used snails and/or a rabbit snared in the field. The recipe I have provided here is just a basic combination of sausage, chicken and seafood. But I truly encourage you to branch out and try adding a variety of proteins. Some of my favorite additions are: Pork belly, lobster, prawns, scallops and little lamb meatballs. Try adding green beans or favas…even red bell peppers! Most importantly remember to let the imagination of your palate lead you and HAVE FUN! For this recipe you will need a deep (minimum 4”) large saute pan with a tight fitting lid. In a large deep saute pan heat the olive on medium-high heat and begin caramelizing the diced onion with the Kosher salt. When the onion is about halfway to being soft add the sausage and garlic. Continue to saute on medium-high heat until the onions are soft and the sausage is browned. Add the tomato and parsley. Saute until the tomato is very soft. Lower the heat slightly if the mixture begins to over brown. Stir in the rice and a pich of Saffron or ¼ oz Azafran. Mix until it is well coated. Add the chicken, fish and shellfish. Mix to coat and add the chicken broth. Cover with a tight fitting lid and place into a 400° preheated oven. Bake approximately 30 minutes. Salad Nicoise is a classic French countryside dish often served as a starter course or for a light lunch. Pair this with a nice crisp dry white wine. For the dressing combine the first 8 ingredients in a jar with a tight fitting lid and shake vigorously. Set aside to allow the flavors to marry. 1. Boil the potatoes in salted water until just tender when pierced with a knife. Cool in the refrigerator. 2. Place the eggs in a pot of cold water and bring to a vigorous boil. Remove them from the heat and let stand in the pot for 10 minutes. 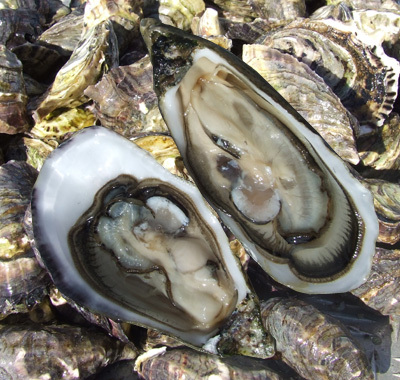 Cool under cold running water until they are cool enough to peel. 3. Start a pot of salted water boiling. Drop in the green beans and cook until done but still al dente. Cool quickly in the refrigerator. 4. 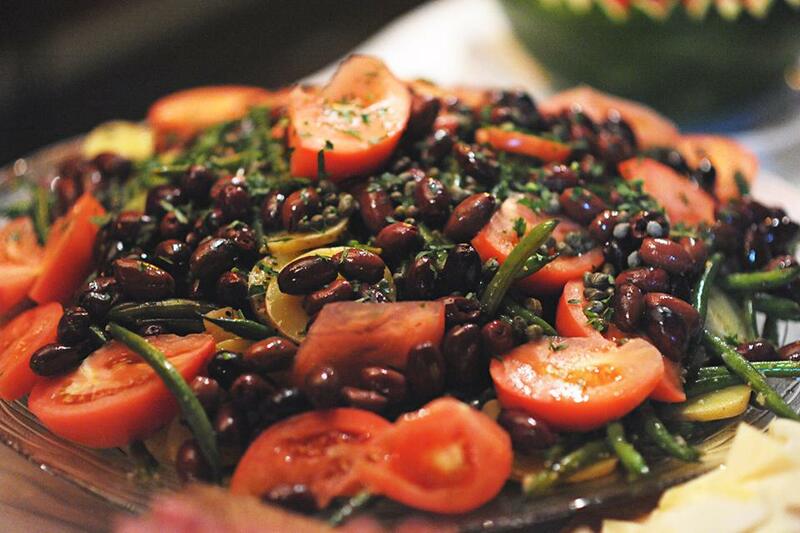 In a large bowl combine the cooled potatoes, beans, tomatoes, olives, capers, extra virgin olive oil and dressing. Mix well and let sit 30 minutes to an hour before serving. 5. Place a serving on each plate and garnish with quartered boiled eggs and the tuna of your choice.